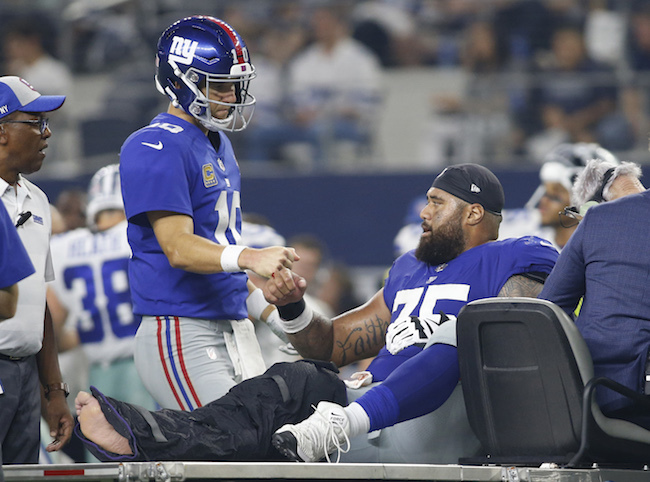 New York Giants center Jon Halapio is done for the 2018 NFL season as the team revealed that he suffered fractures to his lower leg and ankle during the game on Sunday night. He will soon undergo surgery to repair the injuries. Opening Remarks: After watching the tape, I don’t have really anything new to add aside from the fact that we’ve just got to play better in some areas, and we’ve got to make more plays and give ourselves a chance to win. I’d like to see us get a faster start and basically continue to play hard through the game like we did, but we’ve just got to find a way to make the plays necessary to win. I’ll take your questions. Q: What can you do as a head coach and especially as a play caller to try to get those fast starts? Obviously you’re trying to start fast every game, but seeing what went on the first two games, what could you do to change things up to maybe force feed a faster start? A: Certainly we want to stay on the field, see if you can get some big plays in there, that’s important. We had one third down that we missed by inches and I chose to punt it the first time. At times, to be able to drive the ball and get big chunks – that’s what you want to try to do on every drive, we’ve just got to try to it better, sooner. We’ve got to get in the end zone, quite frankly. Q: After watching the film and looking what the Cowboys did on defense with the twists and all that stuff, how much of that caused confusion with the offensive line, and were they prepared for what was thrown at them? A: I think our guys were prepared. We were well aware of the fact they have been a defensive front that moves quite a bit. They have done it for years, that’s their style. We were aware of it and some of the pressures we practiced. I think we had a hat for them in most occasions, one time we had it picked up and we just didn’t slide through it. We’ve just got to do a better job, I don’t think we faced anything we hadn’t seen. We’ve just got to be cleaner with our blocks. They got on our edges a little bit too much. Q: We know that Jon Halapio broke his leg and ankle and is out for the year, where do you go at center now? A: We have guys on the roster who have played center, John Greco went in there and played and then we brought in Spencer Pulley on the roster who played all last season at center, so we’ve got guys that have done it and they’ll just slide up and get ready to go. Q: Is Greco the first option or were you just going with the guy who was active last night? A: We’ll start with John and then obviously get Spencer ready to go. Q: Do you have an update on the severity of Eli Apple’s injury? A: I have no updates other than he had to leave the game with a groin, I guess it was. We’ll see where it’s at. We’ll know more tomorrow. Q: Back to the stunts and blitzes. If you were prepared, why do you think you didn’t handle the pressure well? Was it a communication issue, there’s a lot of former players out there turned analysts today saying that it was a schematic thing – do you not see it that way? A: I don’t know, I’d have to ask whoever those former players are what it was. There are times when we had a hat for them, you’ve got to pick it up. We had one certainly on the fumble where it was a full slide, we just didn’t slide through, it was communicated. I don’t know. Whoever made those comments, they’d have to ask me. Q: Is it too early in the season to make any kind of drastic personnel changes? Would you prefer to remain consistent whether it’s a player on the offensive line or wherever else – would you prefer to try and remain consistent or do you think with an 0-2 start, some consistency struggles with something like that could be necessary for week 3? A: We look at everything all the time. I think what’s important is we stay the course, get the players that we have playing better, and try to make more plays to do what’s necessary to win the game. Q: When you look at the first game against Jacksonville, really good team you played well – was this past Sunday a step back? A: No. Absolutely not. We didn’t win the first game and we didn’t win the second game. That goes back into that thinking you did good when you didn’t win. We’ve got to do what we have to do to do the things necessary to win the game, period. We really don’t worry about all of that stuff. Q: Through two games, considering the personnel you do have on offense, why has it been so difficult to sustain drives, to get into the end zone, to score points? A: I think I’ve been answering the same question over and over in different ways, but we’ve got to do more to stay on the field instead of ending six inches short, just keep the drive alive. We’ve got to do better in all areas, we just have to play better. Q: On your third downs this year, an inordinate number of those plays the ball has been thrown short of the sticks. What do you think of that? A: First of all, I don’t think that’s correct, but go ahead. Q: All seven of your third downs in the first half, you didn’t throw the ball to the sticks. Is that not inordinate to you? The second half of the last game, too, I think it was six of seven. I’m just wondering what you think of it? Is that what you’re trying to do on offense, is that just circumstance? A: Obviously, the plays are designed to get the first down, and there’s times when you’re playing against man coverage where you get catch-and-run scenarios, and then there’s other times when you have layered passes where you have a downfield throw and then kind of a shorter throw that requires a run to get the first. Depending on how all that plays out, really doesn’t matter as long as you get the first. Then if you didn’t get it, you didn’t get it. Q: Did you see opportunities yesterday where (Eli Manning) could have hit (Odell Beckham and Sterling Shepard), or was the pass rush such that you didn’t have a chance on those kinds of plays? A: There are times when you have to move slightly or dependent on what’s happening, you don’t have the ability to get the ball down the field. Certainly we’re always trying to do that and we didn’t get the chance to do that as much as we wanted to. Q: I know you’re aware of what happened last year. Do you feel like you have to be cognizant of where this team is mentally right now more so because of that or do you just view it as everyone has a clean slate and it’s still the second week of the season? A: We’re trying to grow away from that the best we can, and put all our efforts into beating Houston. That’s where we’re at. A question like this just kind of brings it into focus when that’s not something that we think about. Q: When you look at the number of hits (Eli Manning) has taken, obviously you worry about him physically, but do you worry about him getting a little bit of whiplash from those hits and maybe speeding things up knowing that he’s going to take another big hit? A: Eli is a competitor. We’re going to do everything we can to protect him. There was times last night where he wasn’t protected well enough, and we just keep playing and try to get better in all areas. Q: On the defense’s performance – what did you see in the handling of Dak Prescott, especially when he was on the run? It looked like there wasn’t a lot contain on the edges. A: I thought the general part of their running game, I thought our guys did a pretty good job. There were a couple times in the zone read situations where we could have done a little bit better job. Q: When you look at the tape and look at that game yesterday, can you single out some players who you thought played well? A: We lost the game. There are certainly some guys that behind the scenes will be told that this was good, but here still are your mistakes. Ultimately, we didn’t play well enough to win. The Giants are 0-2 for the second year in a row and for the fifth time in the last six seasons. Running back Saquon Barkley set a Giants franchise, single-game record with 14 receptions (for 80 yards).